Steve Ditko has achieved legendary status in the world of comics with his co-creation of Spider-Man with writer/editor Stan Lee but, in my opinion his greatest work was not the web slinger but rather Ditko/Lee's other less famous character Doctor Strange. Ditko's plash page from Strange Tales #132, May 1964 conveys a striking sense of design. Spider-Man was a huge success for Marvel thanks in no small part to Steve Ditko. His depiction of wiry teen age Peter Parker epitomizes the character. Stan Lee actually chose Ditko over Jack 'King' Kirby because he felt that Kirby's work was too masculine and he wouldn't have been able to convey the youth of Parker as well as Ditko. Doctor Strange, the master of the mystic arts, originally appeared in Strange Tales #110, July 1963, as a co-feature with ol' flame head, the Human Torch. He would later be replaced by the James Bond like super spy, Nick Fury, agent of S.H.E.I.L.D. Strange Tales #132, May 1964. In Doctor Strange, Ditko pulls out all the stops on atmosphere. For the physical world he creates this rich noir-ish atmosphere of shadowy city streets wet with rain. As Stephan Strange navigates through these streets you can imagine extradimensional creatures hiding behind cars or malevolent mages lurking in the dark doorways or adjacent streets. Ditko has a facility for design. Not only are his panels well designed but his costumes have a beautifully playful quality about them. All the crazy magicians wear wonderfully imaginative costumes with Celtic-like twisting motifs. His depiction of magic is equally well designed with it’s twisting tendrils of energy sliding out in all directions. Stan Lee helps greatly with the atmosphere by creating believable wizard Speak with such catchy phrases as “the Crimson bands of Cyttorak” or “The Hoary Hosts of Hogarth”. Then you have Ditko’s alien dimensions with their surrealistic floating lips and patches of web-like protoplasm. He would have given even Salvador Dali a run for his money. Many people have been surprised to learn that Ditko was able to create such trippy alternate dimensions without the use of hallucinogens. When Doctor Strange is engaged in combat, you really feel the palpable threat of Baron Mordo bearing down on him. Ditko depicts it in a wonderfully powerful image where you can almost hear Strange gasping in exertion and smell the sweat bead up on his forehead. Lee/Ditko’s Doctor Strange is definitely one of my all time favorite comics. There just seems to be something timeless about it, like it contains some kind of untapped potential or mystery, and that if I just studied it long enough, it would open up new worlds to me and reveal it’s secrets. It’s been a rewarding study so far but I haven’t finished yet. This article is fantastic, Piperson. I've referred back to it four times now---well done. The comments between the various pages is the best way to present detailed critiques of art and story. Dr. Strange and Spider-Man were career highs for Steve Ditko. At no other time did he draw comics that ran three or four consecutive years and thereby assembled a large body of concentrated work in a short amount of time. 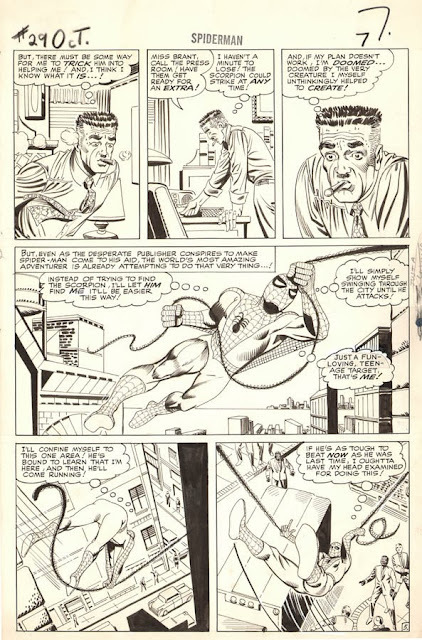 Ditko really 'grew into' the artwork of Strange and Spidey and, after a year or two of working on each, achieved an extraordinary grandiloquent character comfort zone. Ditko reached a plateau so high he never equaled it again in anything else he ever did. Remember how weak his art in the last issues of Doc Strange and Spidey is? That's how Ditko drew for the rest of his life. The passion was suddenly all gone. A pity. The content of this blog is owned by the respective copyright holders and is reproduced with fair use for the purpose of education and entertainment. This blog celebrates comics and their creators and encourages people to explore more deeply the subjects presented here and support our comic creators by buying their books and art. Most comic creators make comics for the love of it as it's often not a very lucrative business. Comic creators need all the love and financial support they can get and deserve it for the joy they bring to our lives. If you enjoy this blog please click on an add or use the Amazon link to buy a book. Your support will help generate new posts about the comics we all love. Like the best comic creators, Jim Rugg is an amazing blend of low brow pop culture and high brow conceptual art. Avengers #58, "Even an Android can Cry"
Get well soon Frank Miller! A tribute. Adventures of Deadman in the National Lampoon! Cool links to comics and comic related stuff! Slay, Monsterbot of the Deep!! Have a Top Ten Christmas! I enjoy creating stuff. Sometimes it's art, and sometimes it's crafts. I love to draw, make jewelry or other crafts, and sometimes it's writing stories. I am inspired by spirituality, indigenous culture, nature and all kinds of art, from fine art to pop culture like comics. Anything that is creative.